Paris is known for many things—one of which is a chocolate lover’s paradise. With a wide selection of expert chocolatiers and excellent artisan boutiques scattered all around the city, Paris is truly a chocoholic’s haven. 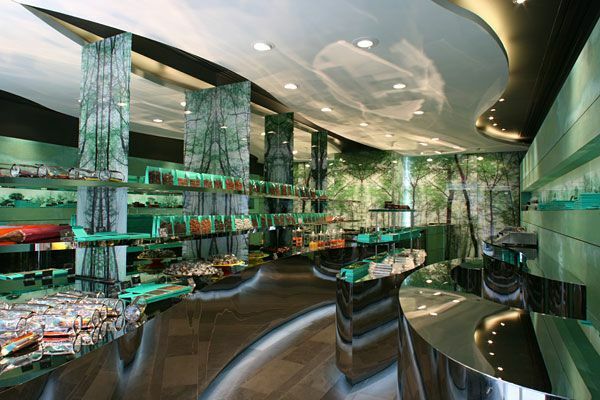 Today, let’s take a look at 15 of the most exciting and must-visit chocolate shops in Paris. Ready to take a bite of this delicious list? Let’s begin! First on the list is no other than La Maison du Chocolat. With its several stores in Paris (eight now, and still growing) and other cities around the world (Hong Kong, New York, Tokyo, Seoul, London, etc), you can be sure that this “creator of legendary chocolate” truly knows a thing or two about awesome chocolates. 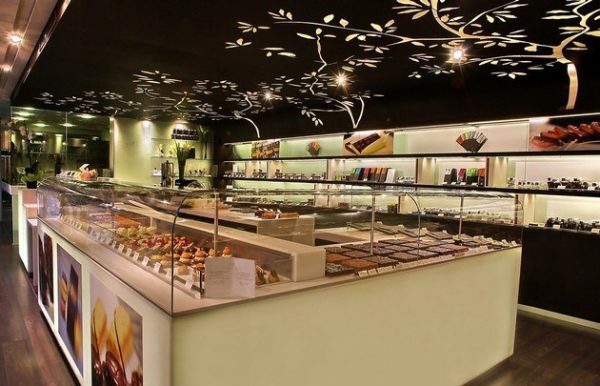 Founded by Robert Linx with over thirty years of experience as chocolatier, La Maison du Chocolat has plenty of choices to offer even the most discriminating taste buds: from creamy ganaches to the most luxurious truffles and mendiants. You can also try their chocolate pastries, a soothing cup of hot chocolate, or chocolate ice cream when you drop by at any of their branches in Paris. François Pralus is a master chocolatier that hails from Lyon, but his chocolate shops can be found in a handful of cities around France, including Paris. 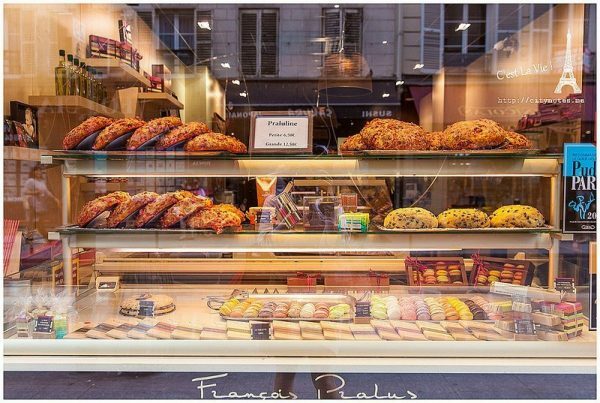 When you drop by the popular Paris Pralus boutiques, don’t forget to grab one of the brightly packaged bonbons as well as the much-loved La Praluline–a rich brioche flavored with praline bits. There are currently two Pralus shops in Paris right now: one in rue Rambuteau (4ème) and another one in rue Cler (7ème.) You can check out more details in their website: www.chocolats-pralus.com. Jacques Genin once churned out his fabulous chocolate creations from an unmarked laboratory hidden in the 15th arrondissement and sends it to the finest restaurants and hotels in the city. Thankfully, the chocolate gods smiled down upon Paris. In 2008, he finally opened up his very own store in the Marais. Now you can taste his must-try confections at two boutiques: at rue de Turenne in Marais (3ème) and at rue de Varenne in Saint-Germain-des-Près (7ème). There are plenty of delightful creations you can choose from: herb-infused and exotic spiced silky ganaches, fruit patés, almond rochers, caramels, exquisite pastries, and more. So stop by for tea and hot chocolate with a delicious pastry for an experience you won’t forget. Alain Ducasse needs no introduction, but for the uninitiated, he is a legendary chef who holds 21 Michelin stars throughout his career. So as any would expect, his chocolate shops are equally as astounding. Wow your taste buds with some of his finest creations in three stores around Paris: the first one at rue de la Roquette (11ème), another at rue Saint-Benoît in Saint-Germain (6ème), and a third store at rue du marché Saint-Honoré (1ème). Chocolatier Henri Le Roux brings the beauty and flavors of his beloved Brittany into the different confections he makes, but he is best known for the mouthwatering caramel au beurre salé or salty caramel. His other outstanding creations are the delicate Soizig which combines chocolates, nuts, cocoa butter, and buckwheat, and the Ch’tou which is caramel mixed with apple brandy and dark chocolate. 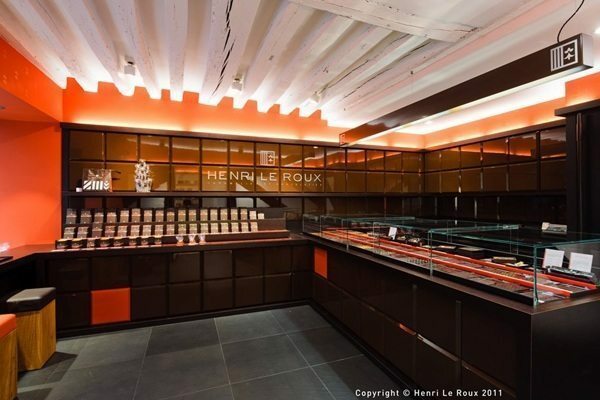 To date, there are three Henri Le Roux shops in Paris (rue de Bourbon le Château at Saint-Germain, rue Saint-Dominique in the 7th arrondissement, and at the rue des Martyrs at the 9th arrondissement). Kids love the whimsical window displays in Jean-Charles Rochoux’s shop, but it’s not only the artistic chocolate figures that catch the eyes of kids and adults alike, it’s the entirety of the shop itself that looks more like an art gallery than a chocolate shop. Featuring chocolates that are as inventive and delicious as it looks, prepare to be wowed by confections that carefully fuse whimsical art and divine flavors: liquor-infused dark chocolate bonbons, basil-flavored ganache, and seasonal collections that make use of fresh fruits and delicacies. You can visit the store at 16 rue d’Assas, 6ème or check out their site at www.jcrochoux.com. 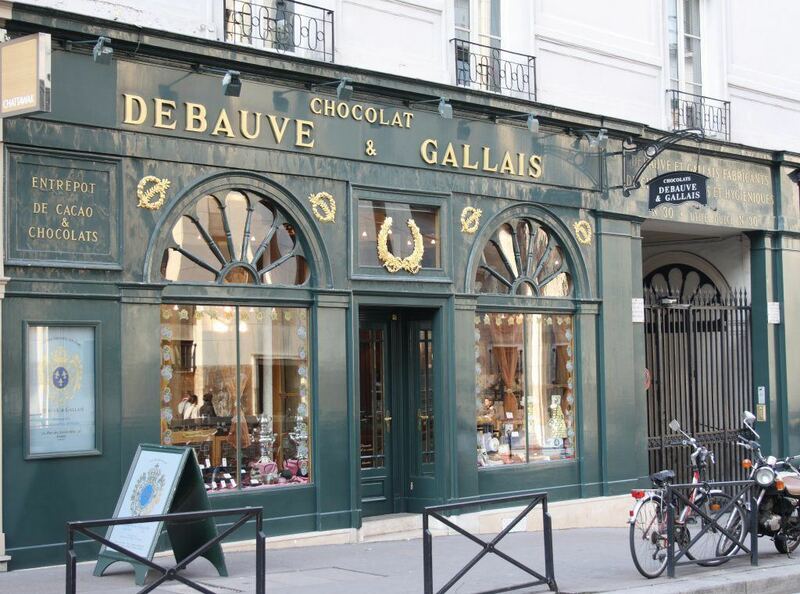 Take a trip down memory lane when you step into the Debauve & Gallais storefront on Rue des Saints-Pères. 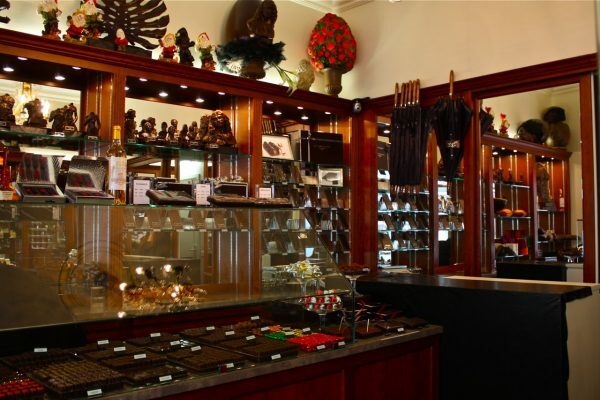 It is one of the oldest chocolate shops in the city having been founded more than 200 years ago, and they have been operating from the same store since 1818. Debauve et Gallais is truly one of a kind. Surely, not every chocolate shop and chocolatier could claim noteworthy customers as Louis XVIII, Charles X, Louis-Philippe, Marie Antoinette, Balzac, Proust, and Brillat-Savarin. But having been appointed as the only chocolate supplier of the French royal family back in 1819, the chocolatier has had its share of huge clients. In 1913, Debauve et Gallais opened their doors to the public and their chocolates are presented in the same regal blue and gold-embossed boxes as the ones they used for their royal customers. You can check out their store at 30 rue des Sts-Pères at St-Germain-des-Prés. Or check them out online at debauve-et-gallais.com. Another old-timer chocolatier, À la Mère de Famille was founded in 1761 and thereby holds the distinction of being the oldest chocolatier in Paris. 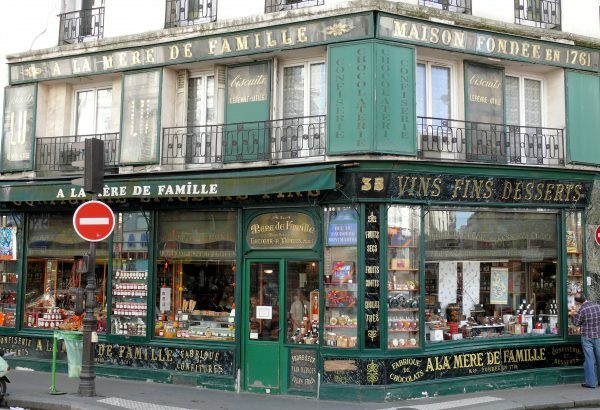 As a matter of fact, their store in rue de Faubourg Montmartre belongs on France’s official Inventory of Historical Monuments. Today, you can find À la Mère de Famille stores in multiple locations all over the city but if you crave the old nostalgic vintage feel, the original store will be your best bet. You’ll find all manners of chocolates being sold in the store,so take your time to look around and grab whatever catches your fancy. It’s not going to disappoint! For a quick online look, head over to lameredefamille.com. Looking for something less intimidating and more traditional? If you’re not into the chocolate shops that display chocolate bonbons in glass showcases, you’d appreciate Maison Georges Larnicol’s fuss-free presentation. Inside the store, you’ll find tubs filled with chocolate that you can scoop out on your own. So go crazy like a kid in a candy store and fill your paper bag with every chocolate that your little heart desires. From rochers to truffles, chocolate marshmallows, apricot-hazelnut galettes, smooth caramels, orangettes, and so much more choices to pick from. But Georges Larnicol’s signature creation is the kouignettes, a miniature, caramelized version of the French classic kouign amann. After that, spend some time appreciating the display windows which are decorated with impressive chocolate sculptures. 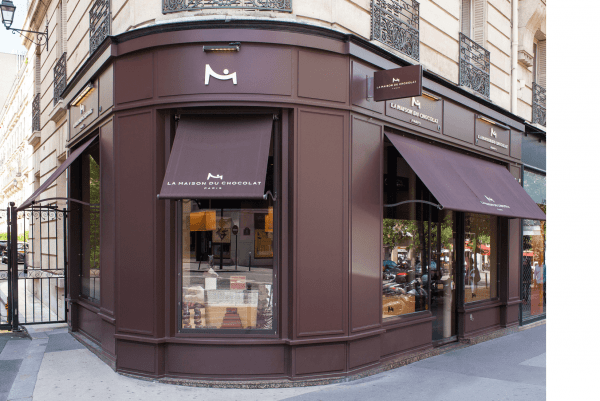 There are currently four different locations of the Maison Georges Larnicol chocolate and pastry shops: at Saint-Germain, Montmartre, rue de Rivoli, and rue Saint-Michel. Their website is chocolaterielarnicol.fr. Oh for the love of chocolate! 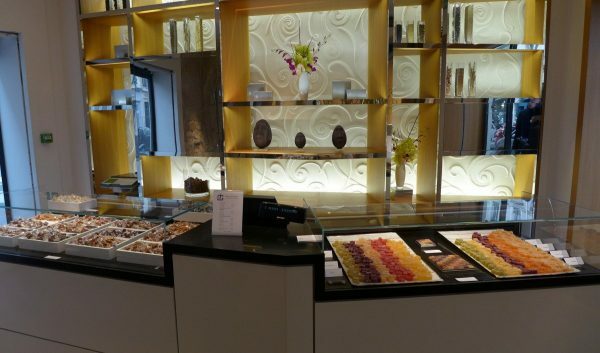 Un Dimanche à Paris is everything a chocolate aficionado could hope for, and more! It’s more than just a chocolate shop—it’s a store, a cafe, a restaurant, a chocolate lounge. It also doubles as an atelier offering classes and workshops for amateur cooks, chocolatiers and pâtissiers. One thing you won’t find here though: fancy chocolate sculptures and ornate designs. Instead, there are simple piles of chocolate squares that are meant to speak for itself. Never ever leave its doors without trying their famous chocolate foie gras, and a soothing cup of chocolat chaud. What should you expect from rockstar pastry chef and chocolatier Pierre Hermé? Well, nothing but the best, of course! Whether you’re drooling for the luscious macarons or the equally mouthwatering chocolates, there are multiple store locations all over Paris to satiate your cravings. Whether you’re on the mood for masterfully-crafted and whimsical chocolate sculptures or the more traditional individual pralines and ganaches, Patrick Roger never fails to deliver. This exciting chocolatier combines quirky innovation with well-loved tradition. His best selling creations include dark chocolate with hot pepper or lime, rhubarb-filled chocolate, lime ganache, dark chocolate praline with orange peel (known as Corsica), yuzu or verbena-infused caramel, and dark chocolate and almonds (called Instinct) among others. You can find several Patrick Roger chocolate stores in different places around Paris including the one in Boulevard Saint-Germain. For more, visit patrickroger.com. Another longtimer in the chocolate scene of Paris is Christian Constant, and like his name, this chocolatier is a constant when it comes to offering prized chocolates. Not to be confused with the chef and entrepreneur of the same name, Christian Constant has two chocolate shops in Paris, and his boutique and épicerie near the Luxembourg gardens continues to be one of the best-loved chocolate shops in town. Here you’ll find chocolate bonbons lovingly created with flowers (i.e. jasmine, ylang-ylang, orange blossom, cardamom, geranium and verbena), spices, and herbs. Raspberry ganache, chocolate bars, pâtes de fruit, caramels, marshmallows, palet d’or made of dark chocolate and fresh cream, ice cream, pastries, and his well-known hot chocolate also steal the show. Visit his shops at the Jardin du Luxembourg and near the Opera, or his website at www.christianconstant.com. 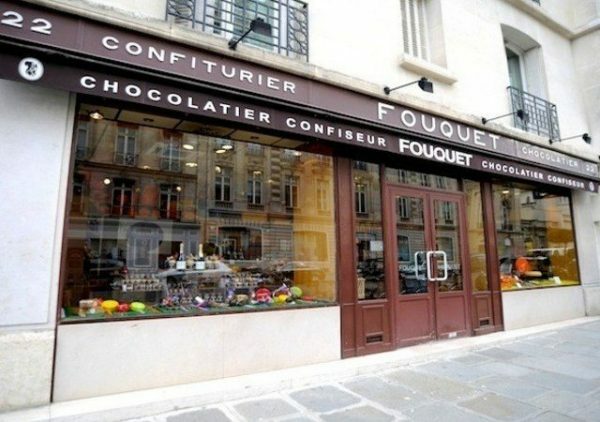 For another jaunt down history, head over to Fouquet, an established Parisian chocolatier offering old-fashioned, handmade bonbons since 1852. 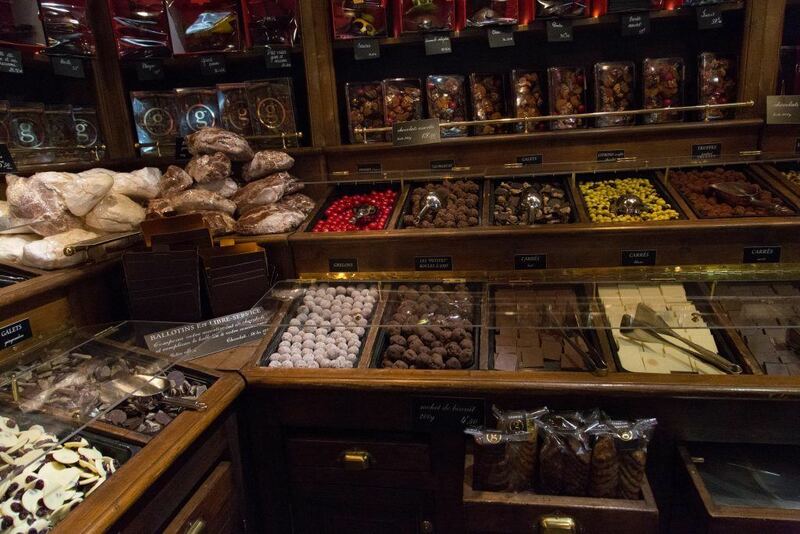 Its historic store in rue François 1er still displays candy-filled windows and glass jars full of chocolates. Here you’ll find all the chocolates you could ever want—from individually sold or boxed chocolate bonbons, spiced wafers thinly layered with chocolate, pâtes de fruit, caramels, dragées, pastilles, chocolate-covered mallows, paper-thin cookies, and many more. 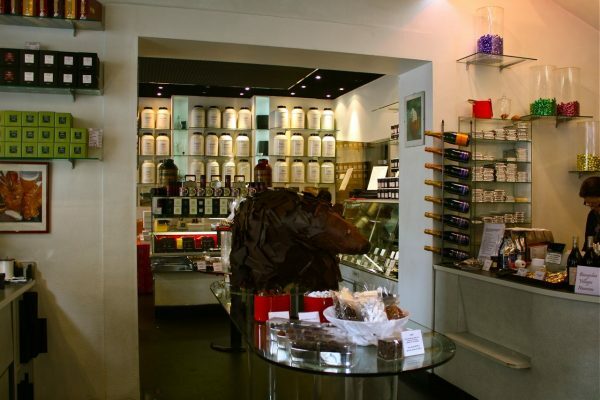 The store also offers gourmet treats from artisans all over France—spices, jams, teas, honey, and mustard among others. For five generations of the Chambeau family, Fouquet honors the family tradition and continues to serve Parisians at the original address and in rue Laffitte at the 9th arrondissement. And finally, the last but most definitely not the least is a well-known chocolatier who is often a mainstay in top chocolatier lists. Tucked in the rue St Honoré fashion district is Jean-Paul Hévin’s posh chocolate boutique and its upstairs hot chocolate bar. At the ground floor shop, feast your eyes and tastebuds on the exquisite individual chocolates, chocolate pastries, single-origin chocolate bars, and masterfully crafted chocolate sculptures. Upstairs you can taste the different hot chocolate concoctions made purely from grand cru chocolate, cocoa powder, and cream paired with lovely pastries and gourmet choices. 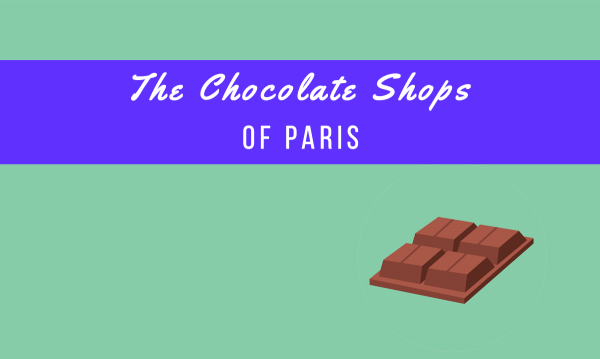 Paris has so many master chocolatiers and amazing chocolate shops that I couldn’t manage to fit everything on this list. But if there are more you would like to add, feel free to leave a comment to share with the rest of the readers. 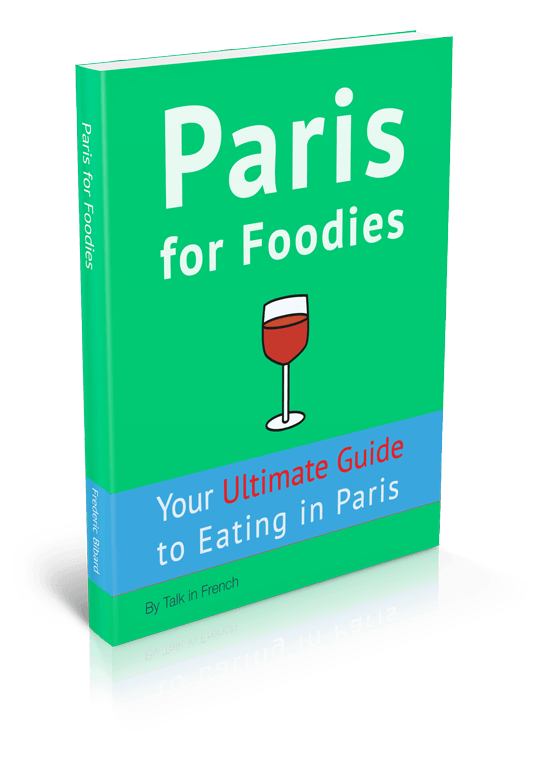 If you’re looking for the best restaurants, cafes, and pastry shops in Paris, don’t forget to grab a copy of my book Paris for Foodies. 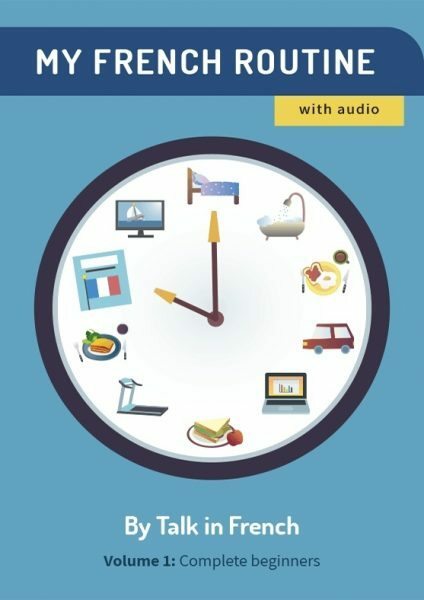 It’s super cheap and very informative; you’ll definitely want to take it on your trip to Paris. Check it out by clicking the photo below.